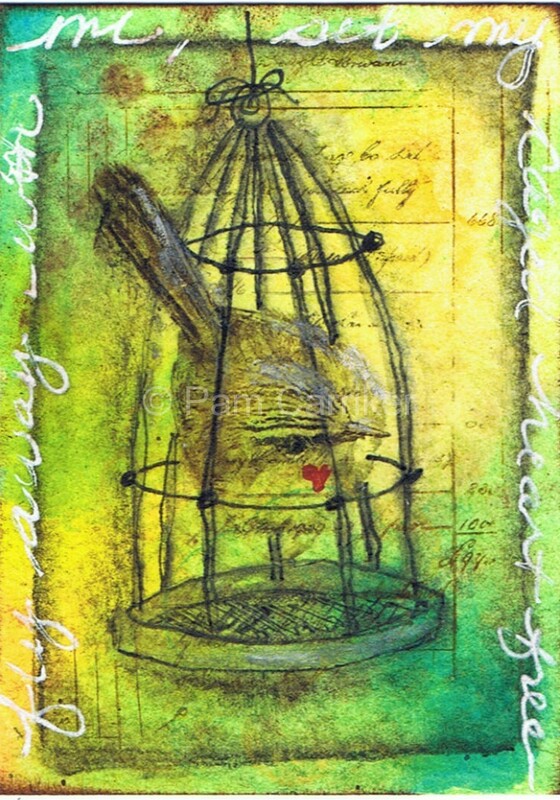 this is the prototype for the Caged Heart ATC I will be teaching at ZNE’s ConvenZioNE at the end of the month. I wanted to include as many techniques as possible in the one hour per class time-table and this demonstrates the use of acrylics with glazing medium, stamping, stenciling, an image transfer method that is foolproof, water soluble graphite pencil with a blending medium, Pitt pen detail, dip-dot heart, journaling, and shading/highlighting with charcoal. I have listed this one for sale in my etsy shop. The theme comes from an ATC that was published in Cloth, Paper, Scissors July ’09.